Microsoft Dynamics GP is built on the strength of Microsoft’s popular productivity tools including MS Office applications, SQL databases, and MS SharePoint to help SME and large enterprises manage their finances more efficiently. Microsoft Dynamics GP takes the old Great Plains and revamped it into a customizable, powerful mid-range accounting solution in the cloud via third-party partners (on-premise available). It has all the standard accounting processes delivered in a logical navigational architecture with links to micro functions. The cloud service allows small and medium businesses to cut IT infrastructure costs without compromising the accounting power of the software. 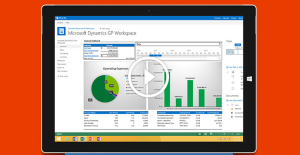 MS Dynamics GP has powerful, role-specific insight with charts and graphs inside and outside of the software. It allows additional information tracking via document attachments like pictures, contracts, invoice copies, etc. MS Dynamics GP maintains financial journal entries with double-entry accounting ledger that supports up to 999 periods. It also automates routine and complex accounts payable tasks with real-time statistical history, easy reconciliation, account control, payment scheduling, and check printing. Other key features include: controls your accounts receivable with automated processes for invoice, receipts, finance charges, and statements; prints refund checks; quick transfer of information between receivables and payables based on vendor record and vice-versa; and track multiple budgets for multiple fiscal years in multiple currencies and General Ledger accounts. The software generates Federal Magnetic Media files to help you maintain full compliance with government reporting requirements and help you attract, retain top talent with customizable hiring processes, scheduling, pay rates, and performance evaluation tools. It can automate and simplify complex payroll processing, while allowing addition of payroll funds to employees’ bank. MS Dynamics GP monitors inventory stock levels and costs and sets prices on customer-by-customer basis and features multiple costing methods, tiered pricing, and alternate vendors. It also allows multiple locations and bins with tracking reason codes and cycle counts, and fast tracking of components and sub-assemblies used in light manufacturing and similar production. Moreover, the software has automated purchasing via preset purchase order and allows people to order materials needed to run the business with approvals within the Requisition Management module. It tracks quotes, orders, back orders, invoices per item and partial shipments and consolidates fulfillment orders into one invoice. The software easily integrates with MS Office and other Microsoft’s productivity tools that you are already using including Microsoft SharePoint and SQL server database. It is accessible through multiple devices and locations for greater flexibility, with dedicated process servers to avoid slowing down your employees’ computers for processor-intensive tasks. Likewise, MS Dynamics GP helps people work collaboratively with task assignments and tracking, plus its deployment is fast through RapidStart Services. MS Dynamics GP can be accessed via desktop (client-server) or cloud service to match your I.T. infrastructure budget capability. Its appearance and functionality can be modified via Visual Basic coding like adding new fields, changing global resources to affect the entire application, and attaching code for less complex business logic. Every business is different, and may need a particular type of CRM Software solution that will be adjusted to their company size, type of customers and employees and even individual niche they support. We advise you don't count on getting an ideal app that is going to work for each company regardless of their history is. It may be a good idea to read a few Microsoft Dynamics GP reviews first and even then you should keep in mind what the software is intended to do for your business and your staff. Do you need a simple and intuitive solution with only elementary features? Will you really make use of the complex functionalities needed by pros and big enterprises? Are there any specific tools that are especially useful for the industry you work in? If you ask yourself these questions it is going to be much easier to get a solid solution that will fit your budget. We realize that when you make a decision to buy CRM Software it’s important not only to see how experts evaluate it in their reviews, but also to find out if the real people and companies that buy it are actually satisfied with the product. That’s why we’ve created our behavior-based Customer Satisfaction Algorithm™ that gathers customer reviews, comments and Microsoft Dynamics GP reviews across a wide range of social media sites. The data is then presented in an easy to digest form showing how many people had positive and negative experience with Microsoft Dynamics GP. With that information at hand you should be equipped to make an informed buying decision that you won’t regret. What are Microsoft Dynamics GP pricing details? What integrations are available for Microsoft Dynamics GP? Pros: I have been setting up and using Microsoft Dynamics GP from the first version and there is no doubt that the vendor keeps improving the software with each new version. They listen intently to customer feedback and carry out the recommended changes. This is clearly evident in their latest release. Cons: You need to use third party apps for a lot of tasks. I think GP should offer more features supported by Microsoft. They should add the top three products used by customers to GP to make it more powerful. Plus, Microsoft products like GP should work with other MS systems. Right now, we have to use workarounds for integration. Another drawback is GP lacks a 64-bit version. Pros: I love the seamless integrations. Plus, it is easy to upload journal entries, invoices and other files without any difficulty. Cons: The software can be difficult to use. I understand that it offers robust controls but it is hard to delete an inadvertent entry or to reprint posting journals. I love the seamless integrations. Plus, it is easy to upload journal entries, invoices and other files without any difficulty. If you need more information about Microsoft Dynamics GP or you simply have a question let us know what you need and we’ll forward your request directly to the vendor.